By the end of 1944, the OKL (High Command of the Luftwaffe) realized that a better high-altitude fighter was needed, and they wanted to take advantage of the new He S 011 jet engine which was being developed. Thus, the Emergency Fighter Competition came into being. By February 1945, three proposals had been received from Messerschmitt, two from Focke-Wulf and one each from Heinkel, Junkers and Blohm & Voss. The Blohm & Voss entry was the BV P.212.03. 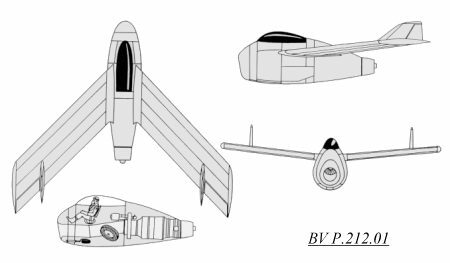 The first of the BV P.212 designs featured a short, squat fuselage, with a short air intake to the He S 011 jet engine in the fuselage rear. The wings were swept back at 45 degrees, and featured a small amount of dihedral. Two small vertical fins were located near the wingtips. The second of the BV P.212 designs was a refinement of the previous BV P.212.01. The fuselage was lengthened, and the wings now featured downturned wingtips in place of the wingtip fins of the BV P.212.01. 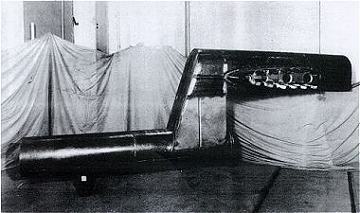 BV P.212.03 design was the bent steel air intake duct that was also used as a fuselage inner load-bearing structure (see photo below). A pressurized cockpit was designed for the pilot, and the armament load could be varied greatly (see table below). 2700 liters (713 gallons) of fuel could be carried, 2100 liters internally in the wings and fuselage and 300 liters in two under wing drop tanks, giving an endurance of close to four hours. Although the Focke-Wulf Ta 183 was chosen for production in late February, three prototypes were ordered and construction began in May 1945, after exhaustive windtunnel and structural tests. The first aircraft was to make its first flight in August and the second aircraft was to be ready by September 1945 September 1945. Of course, the end of the war ended all construction. 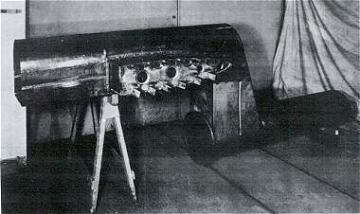 Although this is the steel air-intake/fuselage load-bearing structure for the BV P.211.02, the Bv P.212.03 structure would be very similar. Left: The air intake is on the left, the engine would attach at the right end of the bottom, round pipe. Right: On the left is the fuselage structure, with the wing attachment point clearly visible. The cockpit would be located above the rounded air intake to the right.